Iridocorneal endothelial (ICE) syndrome is a rare ophthalmic disorder, wherein the basic pathology is an abnormal corneal endothelium that leads to varying degrees of corneal edema, iris atrophy, and secondary angle closure glaucoma. It usually occurs unilaterally, in middle-aged women. It is usually sporadic, more common in whites, with no familial, congenital, and systemic associations. The true etiology of ICE syndrome is unclear. Alvarado et al. have proposed a viral cause for the disease. It is considered to be an acquired disorder probably due to Herpes simplex virus and Epstein–Barr virus etiology. The ICE cell is pathognomonic of this syndrome. These corneal endothelial cells are abnormally large and show increased pleomorphism and show epithelial-like characteristics. 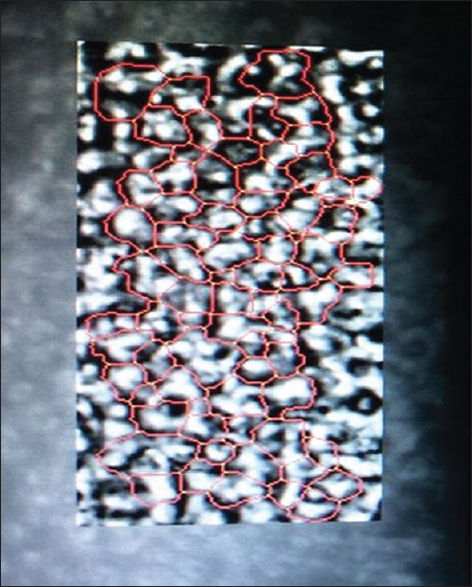 The abnormal endothelial cells may migrate posteriorly forming a membrane that covers the adjacent structures, iris, and trabecular meshwork. 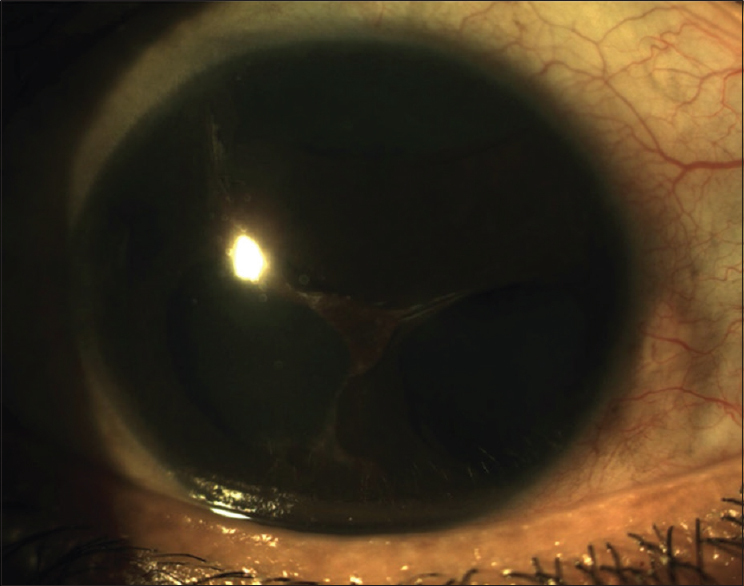 The contraction of this membrane leads to characteristic iris changes, iridotrabecular synechiae, and corectopia. The membrane may occlude the angle and cause open-angle glaucoma or can cause a synechial closure resulting in angle closure glaucoma . A 24-year-old female, with no relevant familial history, was admitted to our clinic which is a tertiary referral center with the complaints of photophobia in her RE. There was no history of redness, pain, or watering. There was no history of trauma. Her general and systemic examination was within normal limits. She had been referred from another center. 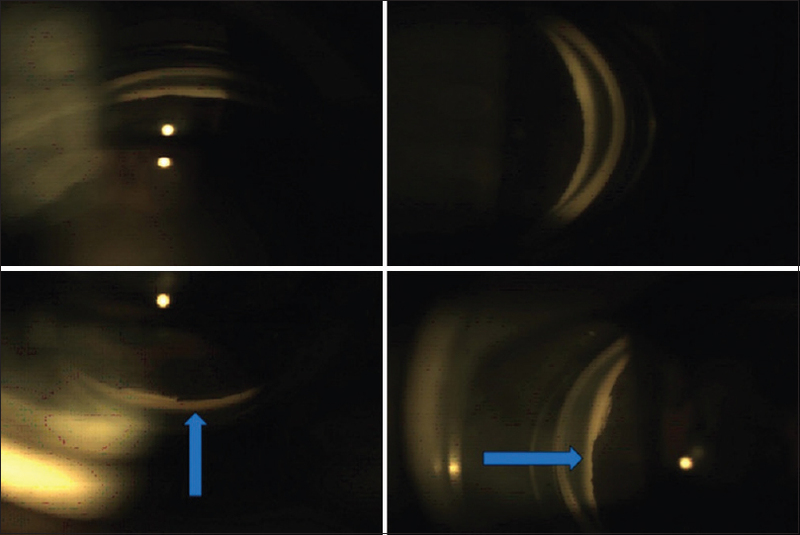 Slit-lamp examination revealed a fairly clear cornea with moderate anterior chamber depth. There was iris stromal hyperplasia with multiple stretch holes at 10 o' clock position and 1 o' clock position [Figure 2] and multiple pedunculated nodules between 5 and 9 o' clock with corectopia and ectropion uveae [Figure 3]. On gonioscopy, the angle was completely closed with patchy synechiae in the nasal and superior angles in RE. 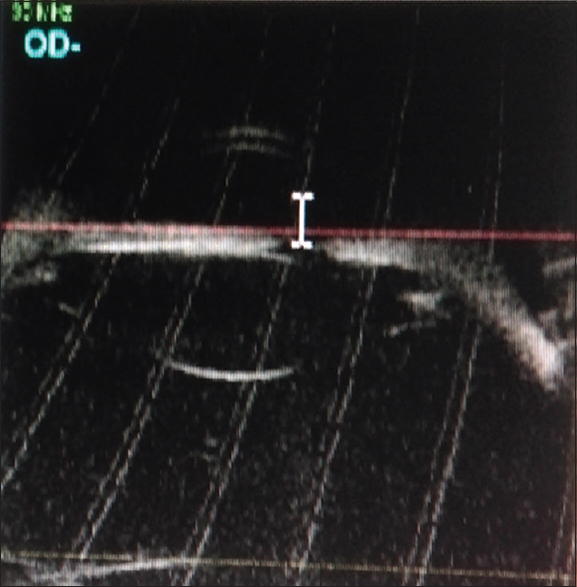 The intraocular pressure by Goldmann applanation tonometry was 48 mmHg at 10 am in the morning in RE [Figure 4]. 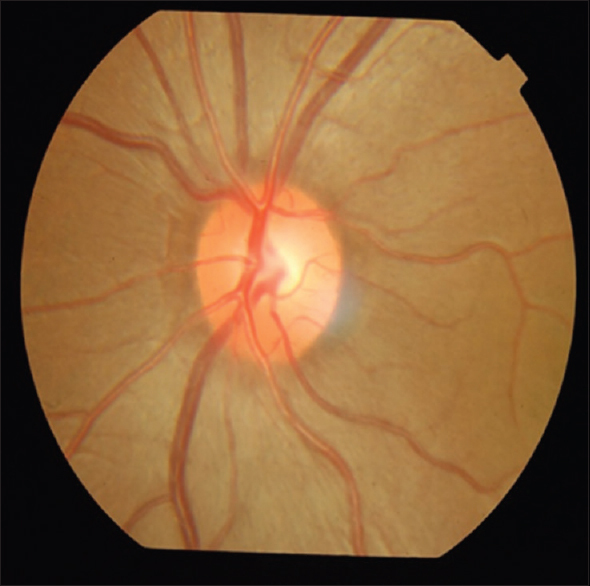 Fundus examination showed clear media in the RE with optic nerve head (ONH) showing a vertical cup-to-disc (CD ratio) of 0.6, horizontal CD ratio of 0.5, and nasalization of vessels. 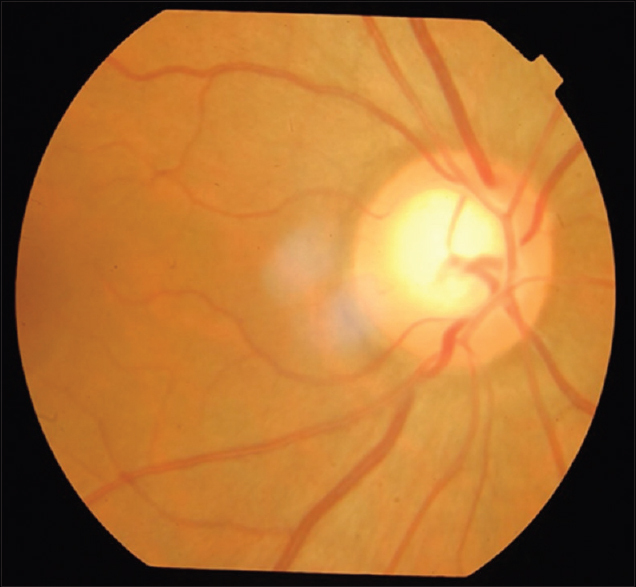 Anterior segment examination and fundus examination of the LE were within normal limits. A clinical diagnosis of OD ICE syndrome was made. LE Gonioscopy showed open angles. 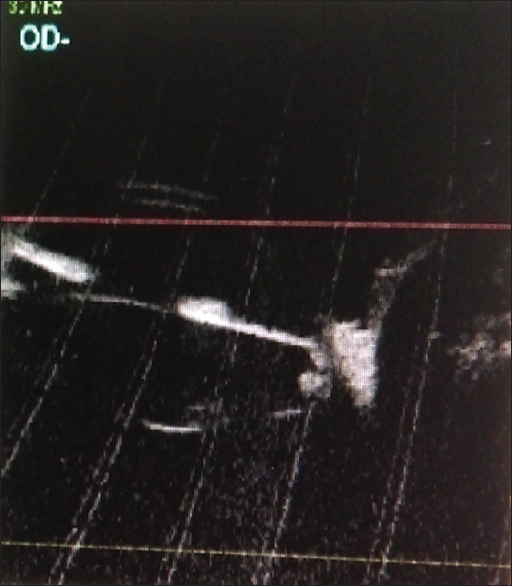 Ultrasound biomicroscopy of the RE showed the central corneal thickness of 0.48 mm. Anterior chamber depth was variable [Figure 5]. 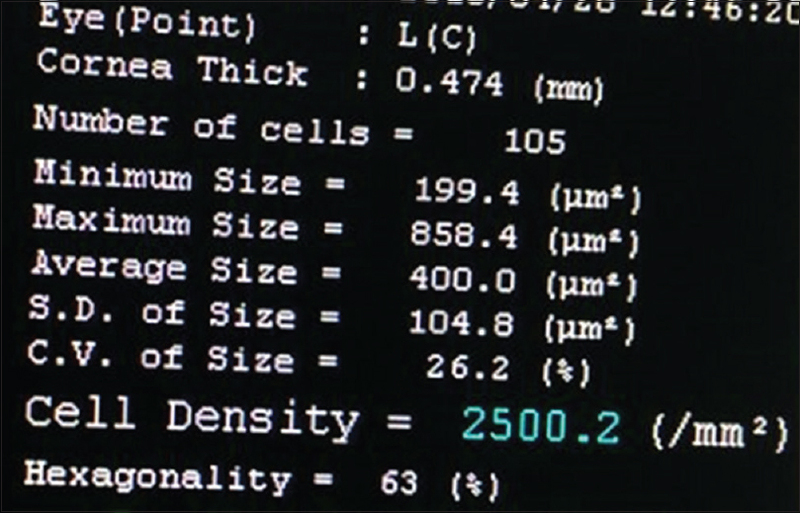 Lens AP diameter was 3.82 mm. 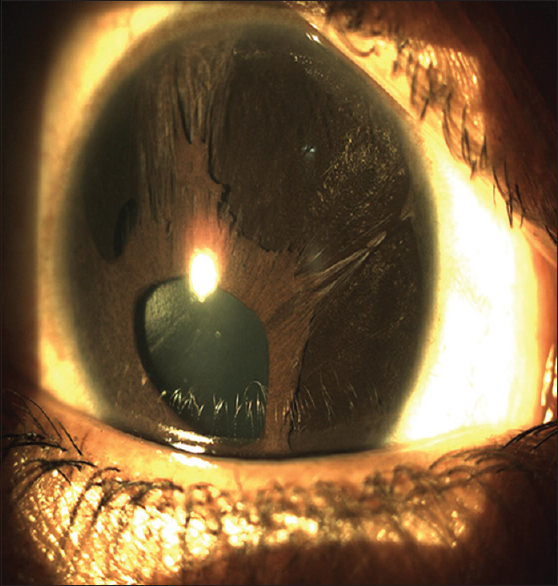 Hypoplastic iris was seen from 4 to 7 o' clock position with stretching and thinning of iris superiorly. Widening of retro-iridic space was noted from 4 to 7 o' clock position. Broad-based PAS was seen in almost 360° [Figure 6]. 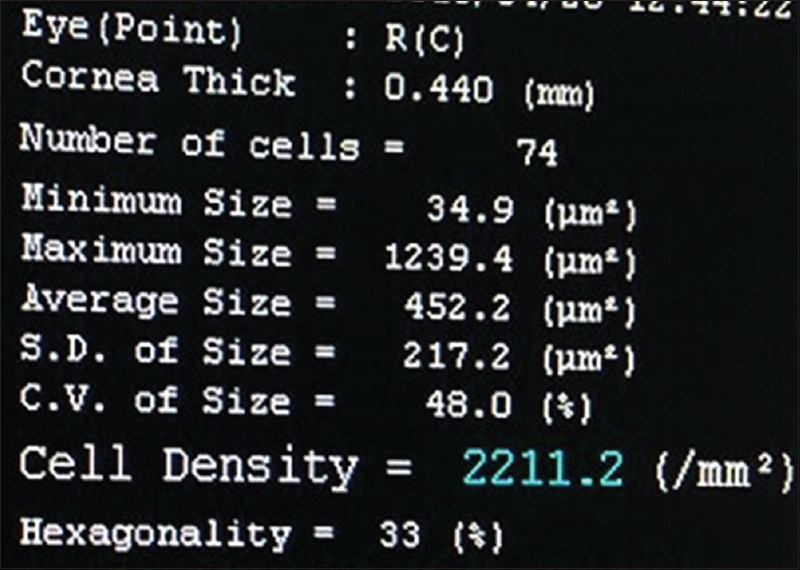 Here, there was polymegathism with a cell volume of 48% (normal <40%). Hexagonality of >50% is considered normal, and in this case, it was only 33%. Rounding off of cell angles, loss of hexagonal shape, and blacked-out areas were seen within the cell [Figure 7], [Figure 8]. Specular microscopy of LE was within normal limits. It showed a good cell density and hexagonality of >63% [Figure 9]. Fundus examination of the RE showed clear media with ONH showing a vertical CD ratio of 0.6, horizontal CD ratio of 0.5, and nasalization of vessels, and foveal reflex was present [Figure 10]. Fundus examination of the LE showed a clear media with normal disc and vessels [Figure 11]. RE AP was reliable. It showed few areas of depressed sensitivity in upper arcuate area with a slight increase in loss variance of 13.2 [Figure 12]. LE fields were within normal limits. The final diagnosis was made based on the epidemiological data (unilateral symptoms in a young female with no family history), patient history (sudden onset), clinical examination (ocular symptoms with no systemic manifestations), and ancillary tests (specular microscopy). The differentials such as Axenfeld–Reiger syndrome and posterior polymorphous dystrophy are bilateral, whereas this was a unilateral condition. Serology was negative for Herpes simplex virus. The final diagnosis was OD ICE syndrome with secondary angle closure glaucoma. The patient was on maximal medical therapy with 3 topical antiglaucoma medications and one systemic AGM. Surgery was recommended because of uncontrolled IOP in spite of maximal medical therapy. She underwent Mitomycin C augmented trabeculectomy with peripheral iridectomy. Surgery was uneventful and the morning IOP after 2 days was 12 mmHg without treatment, the ACD (anterior chamber depth) was moderate, and the filtering bleb was functional [Figure 13]. At 1, 3, and 5 months, the IOP was well maintained without medications, and it was a complete success. At 5-month follow-up, the IOP was found to be raised. It was 24 mmHg. 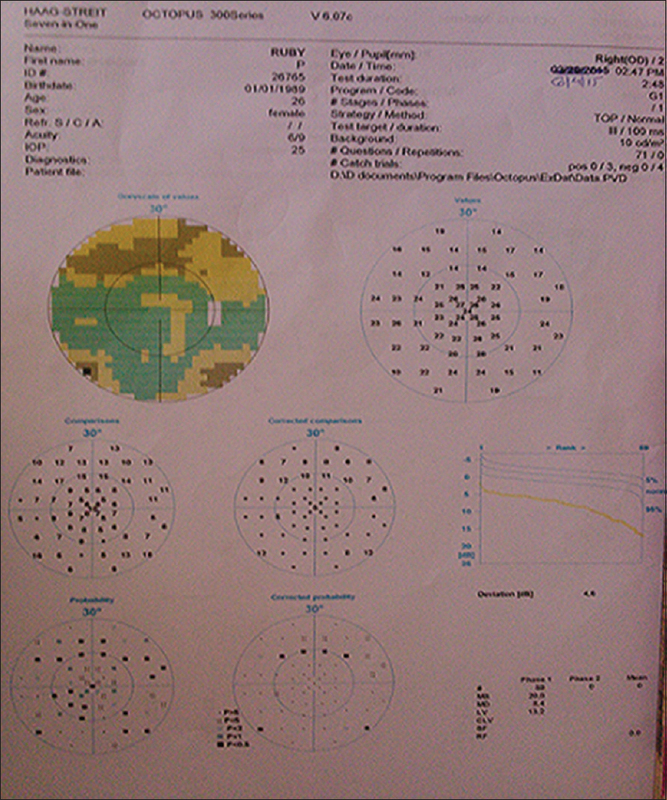 Visual fields did not show any deterioration. She was taken up for bleb needling with subconjunctival 5FU in the inferior quadrant. Her IOP was 14 mmHg the following morning. It was maintained in the monthly follow-ups too. She was lost to follow-up due to personal reasons. Two years later, she presented with corneal edema, decreased visual acuity, and IOP of 34 mmHg. There was a history of 7-month amenorrhea. 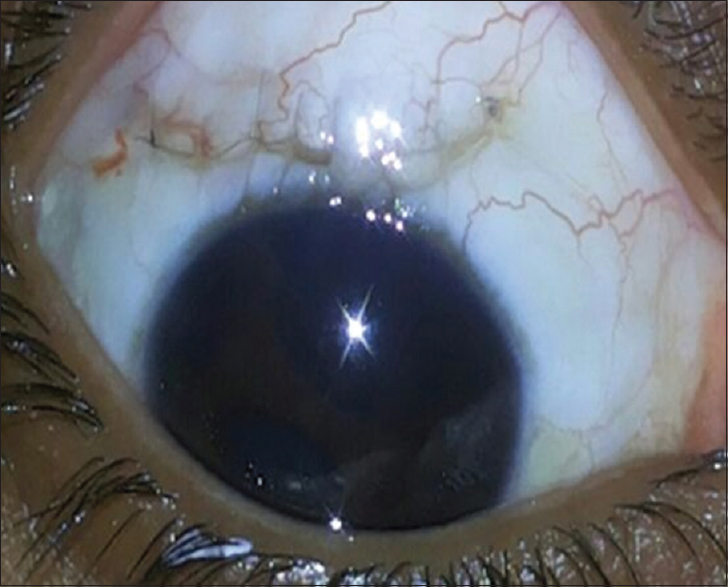 Anterior segment picture taken 2 years later shows the progression of the disease condition. There were new stretch holes, and the stretch hole at 2 o' clock had merged with the iridectomy [Figure 14]. ONH showed the progression of glaucomatous damage. 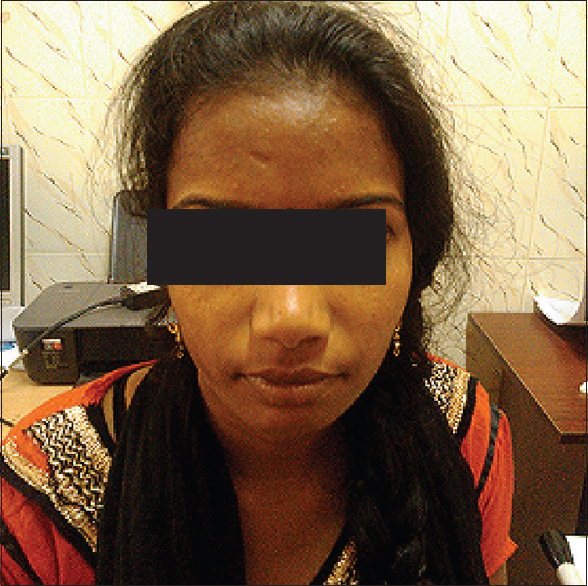 She was treated with topical medications with punctal occlusion, counseled about aqueous drainage implant and was asked to come after the delivery. Trabeculectomy with antifibrotic agents is the surgery of choice for ICE syndrome. Shields et al. have reported a 69% success rate in a study on 33 eyes  while Yanoff and Duker reported a 64% of success rate 1-year postoperatively and a 36% at 3 years. It has strong initial success rates. Unfortunately, failure occurs more rapidly than with most other types of glaucoma for a variety of reasons. The usual cause of failure in these young patients is the robust subconjunctival fibrosis. Another important cause related to ICE is endothelial membrane occluding the filtering ostium and PAS formation that can obstruct the drainage pathway. 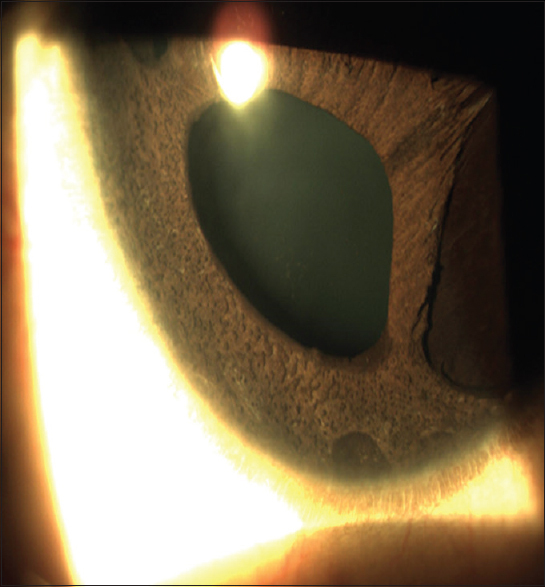 Aqueous shunt surgery is considered by few as a common first-line surgical approach for glaucoma associated with ICE given the intractable nature of the disease. In pseudophakic eyes, the tube can be placed in the ciliary sulcus or pars plana. Success rates with drainage device surgery have been reported to be about 70% at 1 year and 53% at 5 years. The most common clinical variant is Chandler's syndrome (50%) followed by essential progressive iris atrophy (25%) and iris nevus (Cogan Reese) syndrome (25%). The case stands out due to its complexity. It predominantly had progressive changes in the iris and can be classified as essential iris atrophy but there were pedunculated nodules as well. She had features suggestive of both essential iris atrophy and Cogan–Reese syndrome. A long-term follow-up is necessary because the disease itself is progressive in nature. Levy SG, Kirkness CM, Moss J, Ficker L, McCartney AC. The histopathology of the iridocorneal-endothelial syndrome. Cornea 1996;15:46-54. Alvarado JA, Underwood JL, Green WR, Wu S, Murphy CG, Hwang DG, et al. Detection of herpes simplex viral DNA in the iridocorneal endothelial syndrome. Arch Ophthalmol 1994;112:1601-9. Laganowski HC, Kerr Muir MG, Hitchings RA. Glaucoma and the iridocorneal endothelial syndrome. Arch Ophthalmol 1992;110:346-50. Shields MB, Campbell DG, Simmons RJ. The essential iris atrophies. Am J Ophthalmol 1978;85:749-59. Yanoff M. Iridocorneal endothelial syndrome: Unification of a disease spectrum. Surv Ophthalmology 1979;24:1-2. Chandran P, Rao HL, Mandal AK, Choudhari NS, Garudadri CS, Senthil S, et al. Glaucoma associated with iridocorneal endothelial syndrome in 203 Indian subjects. PLoS One 2017;12:e0171884. Kim DK, Aslanides IM, Schmidt CM Jr. Spaeth GL, Wilson RP, Augsburger JJ, et al. Long-term outcome of aqueous shunt surgery in ten patients with iridocorneal endothelial syndrome. Ophthalmology 1999;106:1030-4.